Jacob’s promotes its Cracker Crisps, now in two new summer flavors, Roast Chicken Thyme & Lemon and Mature Cheddar Ploughman’s, in a new advert. The 30-second spot, titled “Get Together”, features two lovers and their families, who are set to meet. The “problem” is what the two households will eat, given their different tastes and perspectives: while to his family serving crisps would be “an outrage”, to her family serving crackers would be “improper”. The saving solution comes from Jacob’s Cracker Crisps. When the young couple put on the table a plate of Jacob’s Cracker Crisps, which combine the big crunch of a cracker with the great flavour of a crisp, the two families leave all differences behind and start shaking hands. 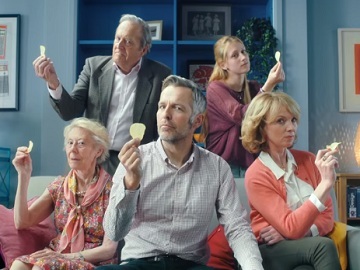 “Get together with Jacob’s Cracker Crisps” – says the voiceover at the end of the ad, showcasing the range of Cracker Crisps flavors, including Sea Salt & Balsamic Vinegar, Smoky Barbecue, Thai Sweet Chilli, and Sour Cream & Chive. The latest flavors, Roast Chicken Thyme & Lemon and Mature Cheddar Ploughman’s, will be available for a limited time only.